During every Japa Retreat we have the opportunity to formally write down our prayers to the holy name. We are again reminded that the holy name is a person, or really the combined persons of Radha and Krishna. Our Christian brothers are fond of offering their followers a relationship to their conception of Divinity in the shape of Lord Jesus Christ. Gaudiya Vaishnavas are also offering their followers a relationship with Radha and Krishna through their holy name, as revealed through Gaura-Nitai and their representatives. We worship and praise One God in multiforms and expansions, and we especially esteem those we represent them. All religions which teach the supremacy of the One God are actually worshipping the same principle of Godhead in different features. After all, we are speaking of the unlimited infinite here, and the science of God as explained by the Vedic scriptures is very complex, yet broad and accommodating. We learn from Shri Chaitanya Mahaprabhu, that there are so many names and forms of God, because of the different natures and desires of his worshippers. According to the intensity and degree of our love God reciprocates accordingly. We might consider Christ the sacrificing aspect of God, Buddha the knowledge aspect of God, while Krishna is the love aspect of God. Krishna is God fallen in love and totally giving himself to his devotees. Krishna remains God, yet in his most intimate, approachable feature--that is his heart, not being seen as full of majesty and power and worshiped in awe and reverence. As Lord Vishnu that is his position as the Maintainer and Sustainer of the Universe. Krishna doesn't loose his Vishnu or Godly power but hides it to facilitate the intimacy of love. We could say that Krishna is the "source of God! ", (or what we think of as God). Krishna is God when he wants to relax and be with his intimate friends and family. What we see in this world has a correspondence in the absolute world, but here everyone is competing to the best, and there everyone loves Krishna as the dearest. In this way we can have a universal picture of God, appreciating the different conceptions, while favoring our own. Krishna has unlimited aspects and different teachers may favor one perspective over another due to their feeling and realizations. This is much different from the tendency of the age of Kali to decry or at worst, kill, those who differ from our understanding. Human ego wants to think only we are right, rather then being thoughtful and pondering the validity of others experience and faith. It is easy to be black and white, but takes more developed spiritual insights to see unity in diversity, or to respectfully disagree. We must go beyond the form, rituals or externals to understand the spiritual essence and universal principles that the religious form is meant to foster. Begging the mercy of Shrila Prabhupada and my shiksha gurus I fall down at your feet. Rising up I sincerely embrace you in gratitude for being my friend and life’s companion. My association with you has brought me everything that I treasure in life—my services, my family, my friends, my reading material, the lectures I listen to, what I think about and reflect on, and my highest aspirations. Your presence in my life is such amazing grace which is continually unfolding and uplifting me. Without my wife’s enthusiasm and taste for you—the holy name—I would have never come to this retreat. I was neutral about attending and didn’t even think about it until I was packing. I knew I was going, yet had no strong expectations or fears. It was just something spiritual to do with my wife and advanced devotees. I guess this expresses my relationship with you—neutral and performed out of duty. However, by the mercy of the devotees, headed by my godbrothers and superiors, HH Sacinandana and Giriraja Swamis, I had one of the best experiences of my life. It was dynamic and ecstatic spiritual life in everyway—a totally absorbing, meaningful, relevant, alive and fun expression of Krishna consciousness. The days raced by and very quickly we created a harmonious and supportive community bound together to associate with you—O blissful, loving, kind holy name—by chanting japa, and singing in kirtana. To support these main practices we heard deep philosophical insights, your wonderful pastimes as the Divine Couple, and about the merciful Lords for Kali, who came to bring you to the material world, Shri Shri Gaura and Nitai! The result of such focused emphasis on increasing the quality and quantity of my personal japa, kirtana, and hearing Radha-Krishna lila, is that I want to increase my association with these practices when I return “home”. Of course I feel very much at home in my current environment, so home is where the heart is regardless of the externals. Please bless me to feel home wherever loving, devoted, mature devotees live and engage in dynamic, loving spiritual practices such as japa, kirtana, Krishna-katha (talks), Deity worship, honoring Prasad (spiritual food), encouraging one another, and positive essential aspects of Krishna consciousness. Let me reside here eternally, birth after birth, or in the spiritual world. By being in the spiritual energy our material identity is forgotten. Thank you for such comprehensive and extensive mercy. May I be empowered to share such a blissful, purposeful way of life with others, in the consciousness of spiritual humility and constant loving remembrance of you. 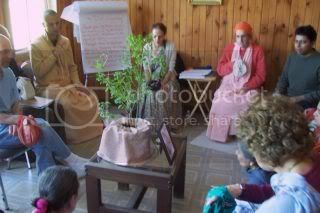 Not only the experience of such retreats is important but what we take with us and put into practice. Many have experienced being greatly moved in some type of workshop, only to lose their enthusiasm. Thus spiritual life is a constant endeavor in good company of those more advanced on the path. And occasionally we have to revisit our spiritual practices to note our progress, and to look at them with fresh eyes and guidance. This can be especially difficult if we have been on the path for a long time, since our tendency is to be comfortable in what we do. So these spiritually oriented retreats are a great opportunity to rekindle our sense of urgency and faith in the process of shuddha bhakti or pure devotion.